We're excited to announce that the Smith Limo will be stopping by Powderhorn this year for a Rail Jam! You can jib the same thing you see in the magazines and videos. And it you don't want to risk flying off a limousine, it'll still be fun to watch everyone. 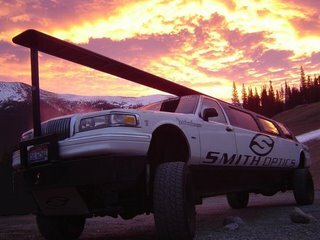 The limo will be here March 31 to celebrate our closing weekend. It's a ways off but just another thing to get excited for!